The Canon T3 adopts the same exposure system which debuted in the company's flagship APS-C format digital SLR, the EOS 7D. Dubbed IFCL -- which stands for Intelligent Focus, Color, Luminance -- the new metering system takes into not only account subject luminance, but also both color information and focus distance. Because silicon light sensors are significantly more sensitive to longer-wavelength light, unless an exposure sensor's response is substantially tweaked via a filter system of some sort (which naturally decreases sensitivity), it will tend to underexpose red-colored objects or scenes, and overexpose ones dominated by blue or green hues. To prevent this issue, the T3 takes advantage of color information provided by its dual-layer autoexposure sensor, with the upper layer being sensitive to Blue/Green light, and the lower layer to Green/Red light. The Canon T3 should hence be able to markedly improve exposure accuracy in situations where the subject is dominated by colors at one end or the other of the color spectrum. The Canon T3's autoexposure sensor divides the frame into 63 separate zones, the data from which can be evaluated in a variety of ways, depending on the AE mode you're operating in. AE and AF zones are aligned, allowing exposure information to be associated with specific AF sensors and the area around them. The T3's AE system also integrates distance information from the autofocus system into the exposure metering process, thanks to a rather clever assumption: If you've identified the subject as being located a certain distance away from the camera, nearby objects that are close to the same distance are most likely part of the subject, too. Thus, rather than simply relying on a spot AE reading centered on the primary AF point, or blindly combining exposure information from a cluster of AE points in some arbitrary geometric grouping around the active AF point, the Canon T3 instead gives stronger weighting to exposure sensor segments that lie beneath adjacent AF points showing a similar distance reading. Although we've not had confirmation of this from Canon, we suspect that the color-sensitive capability of the new AE sensor plays a role here too: It seems highly likely that the T3's exposure system takes color into account and considers contiguous areas of similar color to be an indication of the extent of the subject as well. The Canon T3's exposure metering options include 63-zone Evaluative, Center-weighted Average, and Partial (10% of viewfinder at center) options, but no spot metering mode is provided. Metering sensitivity range is specified at 0-18 EV (at 23°C/73°F, with EF 50mm f/1.4 USM lens, ISO 100). The Canon T3's Exposure Compensation setting allows the user to increase or decrease the metered exposure by up to five stops positively or negatively, in one-third or one-half EV increments -- a much more useful range than the two stops either side of nominal exposure offered in the previous Rebel XS model. Here you can see the coverage of the three metering settings. Evaluative (63-zone) is on the left, Center weighted is in the middle and Partial is on the right. The T3 has no Spot metering mode, but you aren't missing much without it, since Spot is usually not much different from Partial on Canon consumer SLRs. In Live View mode, evaluative metering is always used, however Canon does not specify how many zones. The sensitivity range for Live View metering is specified at 0-20 EV (again, at 23°C/73°F, with EF 50mm f/1.4 USM lens, ISO 100).When Face Detection AF is enabled in Live View mode, the Canon T3 biases the exposure in an attempt to properly expose for a detected face. The Canon T3 offers regular ISO equivalents of 100, 200, 400, 800, 1,600, 3,200 and 6,400. An Auto ISO mode adjusts the ISO as the camera deems necessary, from 100 to 6,400 in Creative Zone modes, or 100 to 3,200 in Basic Zone modes, with the exception of the Portrait mode, which is fixed at ISO 100. For flash photography the sensitivity is fixed at ISO 800 when set to Auto, but will throttle down as low as ISO 100 to prevent overexposure, and will range as high as ISO 1,600 for bounce flash When shooting in Creative Zone modes, it's possible to set an upper limit on the Auto ISO range. This upper limit can be set to any sensitivity between ISO 400 and ISO 6,400, but you can't specify the minimum shutter speed the camera should use before raising the ISO. Bulb exposures are fixed at ISO 800 equivalent when using Auto ISO. An automatic exposure bracketing feature lets you set the Canon T3's total exposure variation (across three shots) at anywhere from +/- one-third or one-half EV, up to +/- 2 EV. The nice part is that the automatic variation is centered around whatever level of manual exposure compensation you have dialed in. Thus, you could manually set a positive exposure compensation of 0.7 EV, and then have the camera give you a variation of +/- 2/3 EV around that point. (This also means that the bracketed exposures can go outside of the standard exposure compensation range, allowing one shot as far as 7 EV from the metered exposure.) The number of shots in a sequence is fixed to three, and the sequence order also can't be changed from 0, -, + (default, under, over). The Canon T3 has the simplified AE Lock button from more recent models, which unbundles the AF Lock feature from the old button on the older EOS cameras like the 20D and 30D. Marked with an asterisk (*) symbol, the AE Lock button simply holds the exposure at one setting while you recompose the image. It's very useful when spot metering, but also when dealing with subjects where you want to draw your exposure from one place, while autofocusing on another. You may hold the AE Lock button down while depressing the shutter release multiple times to maintain the same exposure across multiple shots. Pressing the button with the pop-up flash activated or with an external flash mounted activates the FE Lock (Flash Exposure) function, which fires the flash and locks the proper exposure for the following frame. Through the Custom Functions menu, the behavior of the AE / FE lock button can be changed. By default, a single press locks exposure until the shutter is released, or the T3's metering system powers down, while focus is locked with a half-press of the shutter button. There are three alternatives to this behavior. The first swaps functions so that the AE / FE lock button locks focus, and a half press of the shutter button locks exposure. The second alternative uses the AE / FE lock button to cancel continuous autofocus in AI servo mode, with the shutter button starting autofocus operation, but not locking exposure. Finally, you can opt to dedicate the AE / FE lock button to start autofocus operation while depressed, and the shutter button meters, but doesn't lock the metered value. In Movie mode, there is similar functionality set through the Movie menu, but the last two options are subtly different, since continuous autofocusing isn't available for movies. Instead of canceling continuous autofocus in the second option, the AE / FE lock button pauses a single AF operation triggered by pressing the shutter button before movie capture starts, and focusing isn't possible during recording. In the final option, the AE / FE lock button performs a single AF operation and locks focus when pressed, rather than operating autofocus continuously. As you'd expect, the Canon T3 offers a full range of White Balance settings, including an Auto setting, six presets, and a Custom setting. There is however no direct temperature setting as there is on higher models like the EOS 7D. The six presets include Daylight (5,200K), Shade (7,000K), Cloudy (6,000K), Tungsten (3,200K), White Fluorescent (4,000K), and Flash. The Custom setting bases color balance on a previous exposure, meaning you can snap an image of a white card and then base the color temperature on that image. 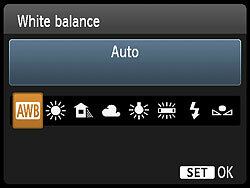 The Canon T3's WB Bracketing is set on the same grid as the now familiar White Balance Correction control. Fairly sophisticated, the white balance correction tool lets you shift the color balance toward more or less green vs magenta or blue vs amber, using a +/-9 step grid format. You move a highlighted square through the grid to adjust the color balance, and bracketing adjustments spread the single square into a cluster of three. As with other recent Canon DSLRs, the Canon T3 offers a Picture Style option through the LCD menu, which lets you select from Standard, Portrait, Landscape, Neutral, Faithful, Monochrome, or three User Defined settings. In each of the preset modes, the Contrast, Saturation, Sharpness, and Color Tone are set for specific conditions. For Monochrome, Saturation is replaced with Filter effect (options are: None, Yellow, Orange, Red or Green), and Color Tone is replaced with Toning Effect (None, Sepia, Blue, Purple or Green). The three User Defined options let you manually adjust each variable, based on any existing picture style, then save it as a custom style. Of course, you can also set the camera's color space to sRGB or Adobe RGB. First seen on the Rebel XSi, Canon's Auto Lighting Optimizer (ALO) function lets you expose for the highlights, preserving detail there, while the camera adjusts the image to open up the shadows. This happens on the fly, as the files are being written to the memory card, so there's no post-capture intervention by the user required to take advantage of this function. We weren't terribly impressed with ALO on the XSi, however newer Canon models including the T3 offer four different settings for it, and the control on the T3 seems quite effective. The ALO setting is made via Record Menu 2, where you can select options of Disable, Low, Standard (the default), or Strong. 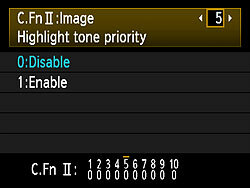 Also included on the Canon T3 is Highlight Tone Priority (HTP for short), a feature that's been on Canon SLRs for some time now, and it's one that works quite well when dealing with subjects with important detail in strong highlights. (Think of the standard wedding dress shot, and you'll get the idea.) 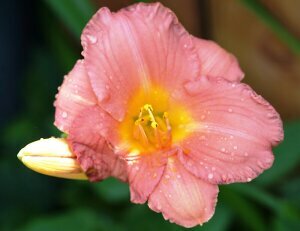 Digital cameras normally expose more like slide film: Once you hit a certain exposure level, detail just vanishes. This really becomes an issue when you're dealing with contrasty lighting and a subject with lots of highlights in it. HTP's action is pretty subtle, but the results are very evident when dealing with strong highlights under harsh lighting. The way it works is to set the camera's base ISO up one notch, to 200, so it's only half-filling the sensor's pixels with charge during the exposure. The Canon T3 then alters its tone curve, basically compressing the top half (that would normally be blown out) into a smaller range, thereby preserving the highlight detail. You can do this yourself when working from RAW files, you just need to significantly underexpose most of the scene, and then fiddle with the tone curve to drastically reduce the contrast, but only in the extreme highlights. If that sounds difficult, it is; it can be a real time-sink, and very difficult to make the end result look natural. Canon's HTP does this for you automatically, though, and the results look just great: You have no sense that the camera has been making radical adjustments to its tone curve; you just see all the detail in the highlights that otherwise would be missing. HTP is controlled via Custom Function setting II-5, giving you options to Disable (the default) or Enable it. The Canon T3 offers two types of adjustable noise reduction. Long Exposure noise reduction can be performed for exposures one second or longer, and works by taking a second "dark frame" of equal duration with the shutter closed, and then subtracting it from the first frame. This reduces or eliminates most noise generated by the sensor during long exposures at low ISOs, but can make noise worse at higher ISOs (at ISO 1,600 and above). Available settings are Off, Auto and On, and are accessed from Custom Function II-3. The Off setting is the default. The T3 also offers the user four levels of high ISO sensitivity noise reduction. Options are Disable, Low, Standard and Strong, with Standard being the default. Though the name implies this noise reduction is only applied at high ISOs, the Canon T3 applies it to all ISOs. This explains why the T3 exhibits minimal chroma noise in shadows and darker tones at low ISOs, when using the default Standard setting. These settings are accessed in Custom Function II-4. High ISO noise reduction is not applied to RAW files, and if set to Strong, reduces the T3's burst shooting speed and depth whenever JPEG images are being recorded. The Canon T3's Continuous Shooting mode is rated by Canon at 3.0 frames per second in high speed mode, for a total of 830 Large/Fine JPEG shots or two frames per second for 5 Raw frames before the buffer fills. When shooting Raw+JPEG together, the T3 immediately fills its buffer with the very first frame, and continues to shoot frames once every 1.25 seconds thenceforth. The Canon T3's Drive setting also accesses three Self-Timer modes, which open the shutter 10 or 2 seconds after the Shutter button is pressed, giving you time to dash around in front of the camera. 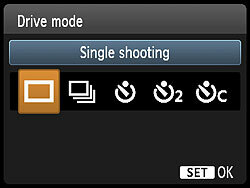 The third mode will take a programmable amount of shots (2 to 10 shots), after a 10 second delay. There is no separate Remote Control drive mode, as the T3 only supports the tethered RS-60E3 Remote Switch, which simply replicates the functionality of the camera's own shutter button, albeit with an additional plastic latch that can be used to lock the button down for longer bulb exposures. The images above were taken from our standardized test shots. For a collection of more pictorial photos, see our Canon EOS Rebel T3 (EOS 1100D) Photo Gallery . Not sure which camera to buy? Let your eyes be the ultimate judge! Visit our Comparometer(tm) to compare images from the Canon EOS Rebel T3 (EOS 1100D) with those from other cameras you may be considering. The proof is in the pictures, so let your own eyes decide which you like best!